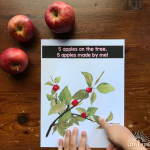 Here is a simple outdoor activity to try the next time you go on a nature walk with your kids! 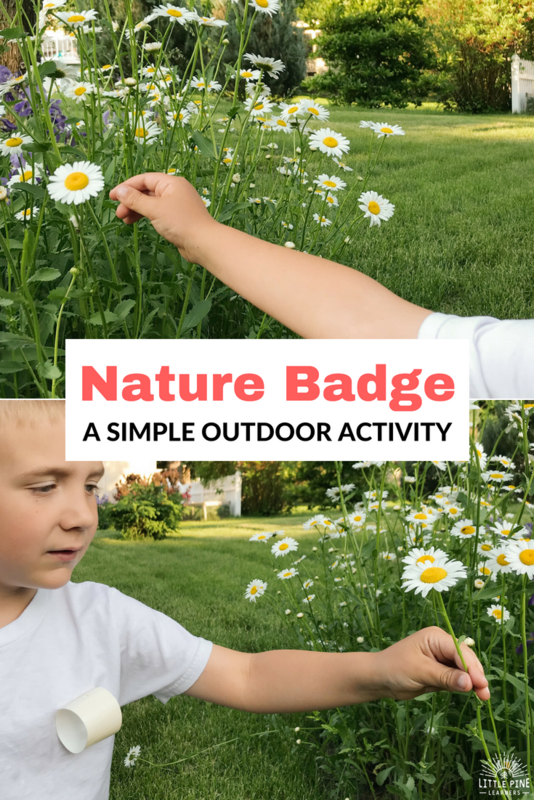 Whether you are hiking on the trails or exploring your very own backyard, this activity is sure to keep your children exploring and searching for their next nature treasure to display on their badges. These are a great alternative to nature bracelets and so fun to make! I found this awesome activity on Little x Little Photography’s Instagram stories. 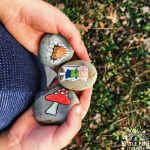 Melissa shares some really great ideas for outdoor learning in her stories, so make sure to give her a follow and see for yourself! As soon as I saw the activity, I knew we had to give it a try. Duct Tape -I wanted to match the tape with his shirt, so we went with white. This activity couldn’t be any easier to prep! Just cut strips of tape about 7-8 inches long, make a loop, and put it on your child’s shirt. I didn’t set any rules for what my son could collect since we were in my parents’ backyard. If you are on hiking trails, I suggest only collecting fallen materials loose on the ground. 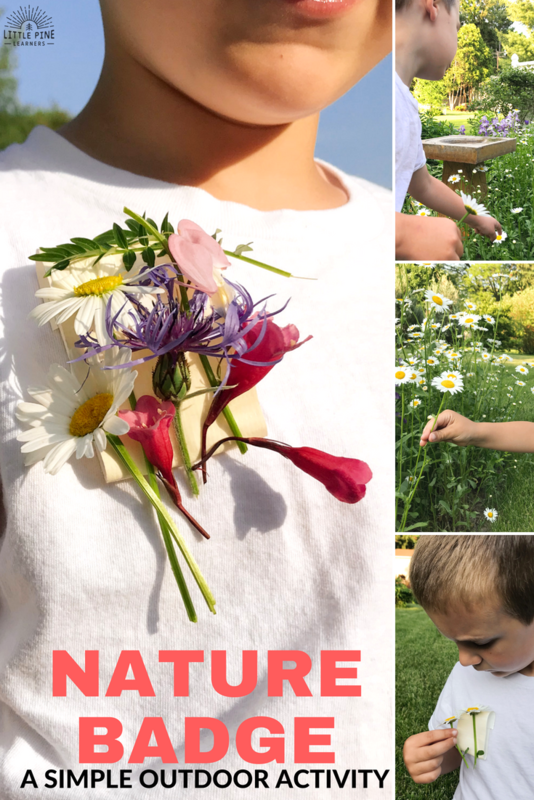 When we started this activity, my son went straight to the flowers growing in my parents’ garden. They weren’t in full bloom the last time we visited, so naturally this was a great place to check out first! My son picked a few flowers, flattened his badge, and started decorating it! We went to several different areas of the yard and it seemed like flowers were the theme of the day because that’s what ended up on his badge. He was so proud of his nature badge when we were finished with the activity and I was happy we spent an hour outdoors right before bedtime! As we looked at the flowers, we named as many as we could. I took photos of the flowers we didn’t know so we could check our identification books later. We talked about the signs of spring as we walked through the yard and started to notice many signs of summer as well! We are excited that the summer solstice is less than a couple weeks away. 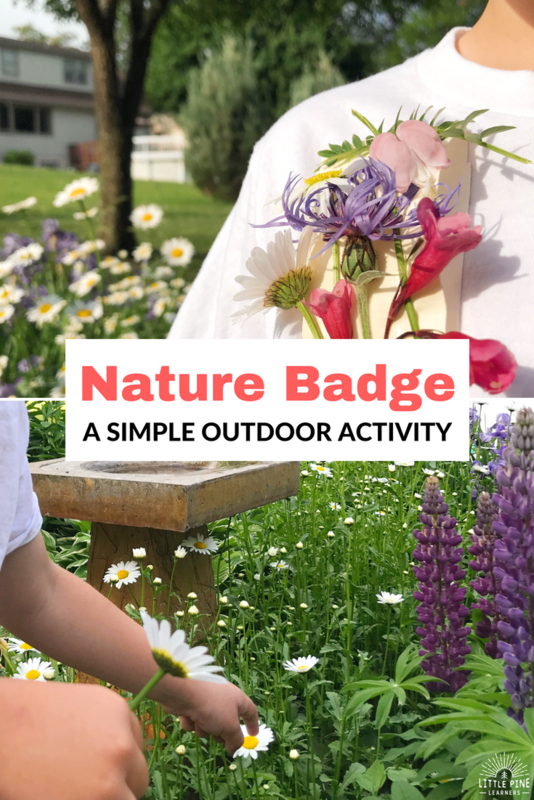 We will be sure to try these badges during all four seasons so we can talk about the unique qualities of each season and the natural materials available during those particular times to year. I think a fall nature badge would be gorgeous! I noticed when my son was picking the daisies, he had to hold on pretty tightly to the stem to pick the flowers. He even commented on how strong his hands were getting from this activity! The last skill that really stuck out tonight was color recognition. We commented on all the beautiful colors of the flowers and my son was determined to find all the colors of the rainbow. Unfortunately that didn’t happen, but we had so much fun searching! I hope you give this fun activity a try! 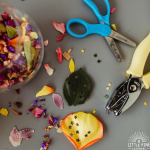 I promise, your little nature lovers will love it as much as my boys. Need more outdoor fun?! Check out Creating a Musical Forest.